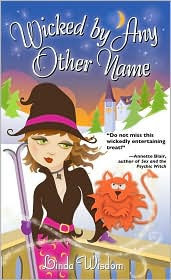 Just a quick note to say the winner was drawn for the copy of Linda Wisdom's Wicked by Any Other Name. Congratulations to Shannon J. of Waterloo, IA. Linda's publicist will be sending the copy of the book. For those who didn't win, thanks for entering. And, remember, the book is a paperback. Maybe you can pick up a copy at your local bookstore. Give yourself a present (I'm sure you deserve one! ), help an author, and help your local bookstore. And, remember, I'm running two other contests this week, so you still have a chance to win! That's nice of you, Mel. Thanks!